IRVINE, Calif. /California Newswire/ — On Wednesday, The Foundation for the Great Park announced that it has committed $25,000 to become the Title Sponsor of the Powerful Ideas Symposium at the XPO, a clean, renewable and efficient energy exposition hosted alongside the U.S. Department of Energy Solar Decathlon 2013 this October 3-6 and October 10-13 at the Orange County Great Park. This sponsorship brings the total combined monetary support of the Solar Decathlon and XPO to more than $1.1 million and the Foundation for the Great Park’s total monetary contribution to $40,000, in addition to in-kind support. The Foundation for the Great Park Powerful Ideas Symposium will feature guest speakers and panelists to engage the public in relevant clean, renewable and efficient energy topics in connection with the world and our everyday lives. These “fast-format” presentations will take place on several stages throughout the XPO on each of the public days during the Solar Decathlon 2013 and XPO. “Recognizing the tremendous impact the Solar Decathlon 2013 and XPO will have on the entire Southern California region, the Foundation for the Great Park’s Board of Directors is proud to support education programs featured at the event,” said Marian Bergeson, Chair, Foundation for the Great Park. The XPO will focus on two key education initiatives: Powerful Ideas Classroom and Powerful Ideas Symposium. Powerful Ideas Classroom, sponsored by the Bosch Community Fund, provides opportunities for children and youth to be inspired about science, engineering, architecture and energy. Powerful Ideas Symposium, sponsored by the Foundation for the Great Park, introduces innovative energy themes, ideas and solutions to adult attendees. Solar Decathlon 2013 will be the first time the world-renowned international competition is held outside of Washington, D.C. The award-winning collegiate competition at the Orange County Great Park will involve as many as 800 students from 20 collegiate teams who are competing to build highly energy efficient, solar-powered houses. For the first time, a large clean energy exposition, the XPO, will be hosted alongside the Solar Decathlon. For eight days (October 3-6 and October 10-13), Solar Decathlon 2013 and XPO will attract visitors from all over California and the world to tour the 20 collegiate team houses and experience a free public event designed to empower innovative thinking and positive change – showing the world that the future of energy is NOW. 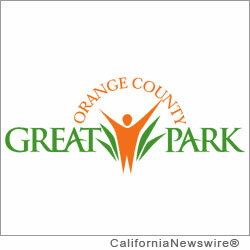 The Foundation for the Great Park joins the growing list of sponsors supporting the U.S. Department of Energy Solar Decathlon 2013 and XPO. The XPO is a clean, renewable and efficient energy exposition, featuring visionary and innovative companies, products and educational opportunities that will be hosted alongside the U.S. Department of Energy Solar Decathlon 2013. The XPO will run concurrently with the Solar Decathlon 2013 from October 3-6 and 10-13 at the Orange County Great Park. Through fun, interactive exhibits and activities, the XPO will educate visitors about the broad spectrum of energy efficiency in home design, transportation, consumer products, food production and education. Visitors will experience actionable ways to implement energy efficiency today and into the future and leave the XPO with tools and resources to live differently. Visit the-xpo.org for more information. Hundreds of thousands of visitors from all over Southern California enjoy the Orange County Great Park’s array of recreational and educational opportunities and participate in shared experiences, including panoramic views from the iconic Great Park Balloon that rises 400 feet in the air. Other Great Park features include the Carousel, Farm + Food Lab, Kids Rock Playground, Walkable Historical Timeline, Palm Court Arts Complex, North Lawn recreation area and Historic Hangar 244. In addition to sports clinics, gardening workshops, weekly Farmers Market and other community events, the Great Park hosts an annual series of special events that provide unique experiences for the entire family, including the Great Park Pumpkin Harvest and the Flights & Sounds Summer Festival. With its approximate 1,300-acre master plan, the Great Park is the centerpiece of the redevelopment of the publicly-owned portion of the 4,700-acre former Marine Corps Air Station El Toro. For more information, please visit ocgp.org.